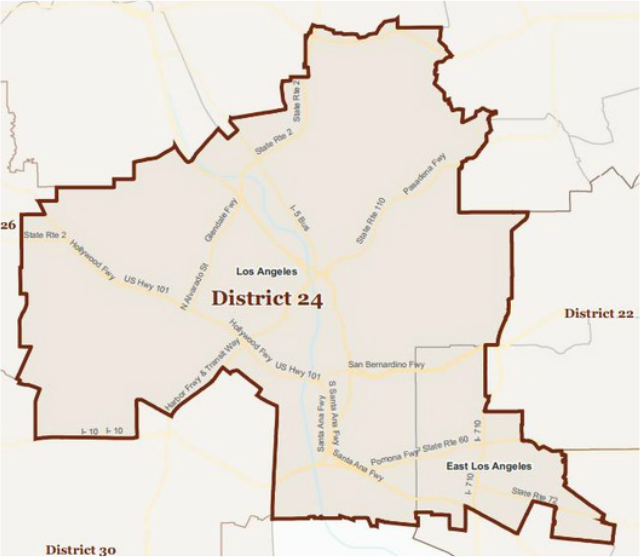 Democrat Kevin de Leon currently represents Senate District 24 and will not be termed out until 2018. This seat will not be up for election until 2018. The first Latino elected President pro Tempore in more than 130 years, Senator Kevin de León (D-Los Angeles) truly embodies the California Dream. Born to the very humblest of beginnings and confronted with a multitude of obstacles, Kevin emerged to become a civil rights organizer, and an accomplished state lawmaker. His mother, Carmen, a housekeeper and a caregiver for the elderly, taught him both the nobility of a hard day’s work and our shared obligation to build a brighter future for the next generation. After years as an educator teaching U.S. citizenship courses, Kevin became a community organizer helping plan the largest civil rights march in California history against Proposition 187. Now, on the 20th anniversary of Proposition 187’s passage, his Senate Bill 396 erases this unconstitutional stain from California law. Following years as an advocate for teachers and public schools with the National Education Association and California Teachers Association, Kevin de León ran for a seat in the California state legislature and won. In the Legislature, Kevin is known nationally for trailblazing legislation such as authoring the 'Yes Means Yes' bill to protect college students against violence and sexual abuse. His efforts to provide retirement security to the millions of low-income workers has been called “a model for addressing a national problem” by The New York Times. He authored the first legislation in the nation to prevent the unnecessary separation of families — protecting against parental rights from being terminated because of immigration status. He also fought to ensure revenue from California’s landmark law to reduce greenhouse gas emissions be directed towards air, water and other environmental quality projects in low-income neighborhoods. Not one to shy away from controversial or complex issues, he co-chaired Proposition 39 – the California Clean Energy Jobs Act — helping to create more than 40,000 California jobs, and generate billions of dollars to modernize California schools. He reformed Workers’ Compensation lowering insurance costs for businesses, protecting workers while increasing their benefits. Kevin secured a win-win for the environment and for California workers, by negotiating a compromise on the single-use plastic bag ban which is a model for balancing jobs and the health of the planet. This year he also negotiated an expanded Film and Television Tax Credit to keep the cameras rolling in California, retaining and creating good jobs. In 2013, he brokered a compromise with Governor Jerry Brown for the passage of Assembly Bill 60, to allow undocumented immigrants to obtain licenses to drive to work, pick up their kids from school and be productive members of our society. Kevin was the first in his family to graduate from high school. He graduated from Pitzer College at the Claremont Colleges with Honors. He is a Rodel Fellow at the Aspen Institute and a Guest Lecturer at the University of Southern California.